“The purpose of building the roundabout is to reduce high speed right angle crashes at the intersection,” stated Kevin Domogalla from the Nebraska Department of Roads. 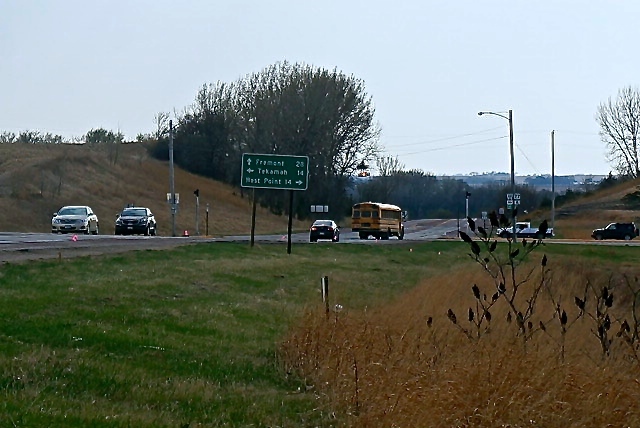 Construction of the roundabout at the intersection of Highways 32 and 77 on the south edge of Oakland is set to begin July 14th. “Crews are working there now taking down trees before nesting season,” Domogalla said. The project is expected to be complete in November. “The crew will have seventy-five working days to complete the roundabout. This is taking weather into consideration,” Domogalla stated. The roundabout will be designed to handle semi traffic. “It will be the largest radius circle,” Domogalla said. Traffic will have detours to follow during construction. “There are five phases of construction of the roundabout and each phase has two stages. Traffic will be re-routed accordingly,” Domogalla stated. As always, Kat Country Hub will keep readers informed as to the status of the roundabout and necessary detour information provided from the Nebraska Department of Roads. A roundabout will soon be in place at Highway 77 and 32, reducing the number of accidents, providing much safer travels. Photo Credit/Denise Gilliland, Editor and Chief, Kat Country Hub. 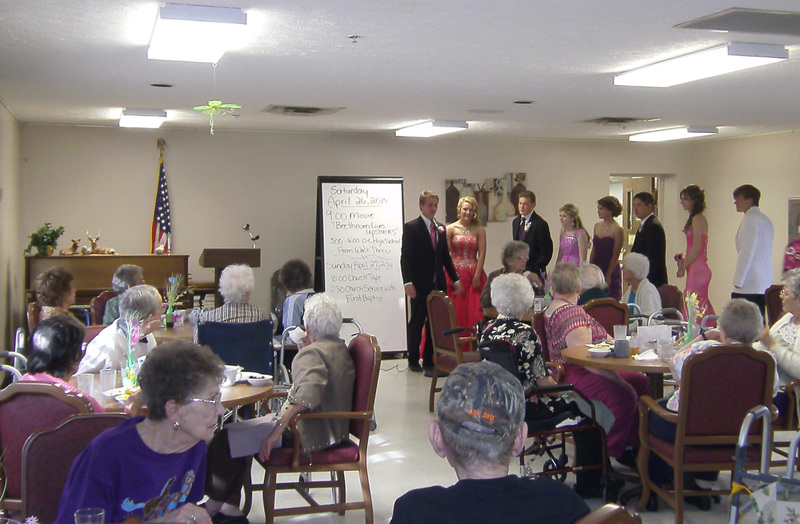 OC students model their prom attire for the residents at Oakland Heights. Photo courtesy of Oakland Heights. Assisted Living side. Next Week on Monday May 5th at 2:30 pm is our monthly Volunteer Executive Council meeting. Church Service for Sunday May 4th at 2:30 pm will be given by the Evangelical Free Church with refreshments served afterwards. On Wednesday May 7th at 1:00 pm is communion with Pastor Hoden. Activities for the week of May 5th to May 10th are as followed, Reading with Marilyn, Manicures, Game Day, Sing a Long, Bingo w/WOW. , Bible Fellowship, General Store, Let’s Play Ball, Crafty Cooking, Friday Bingo, Saturday morning movie, and Lawrence Welk. Volunteers signing in last week were; Judy Nelson, Mary Donovan, Seth Anderson, Dani Moseman, Betty Hanna, Patty Miller, Bonnie Fleischman, Pat Anderson, Sly Rouse, and Mary Alice Pearson. Guest’s signing the Guest book this past week was: Ron and Mary Plageman visiting Dorothy Larson, Also visiting was Janice Rech to see Ann Gahan. And also visiting at the nursing home was Lyle Mueller to see Lillian Mueller. The United States Air Force Heartland of America Band Vortex offers a new and refreshing product sure to excite fans of all styles of music. During concerts, listeners will hear rock, funk, jazz, blues, soul, swing, country, and the latest pop hits performed with a fascinating twist on the typical instrumentation. This eight-member group defies convention by drawing on each member’s musical expertise to deliver unique musical arrangements. Vocals, drums, and guitar entice audiences to move their feet while a thumping tuba lays down a fat groove complemented with lively doses of harmony from a hot brass section. Members of Vortex serve as Air Force musical ambassadors throughout the state of Nebraska supporting civic and educational outreach, recruiting, and special military engagements. This unique and versatile ensemble exemplifies the pride and professionalism found every day throughout the entire United States Air Force. 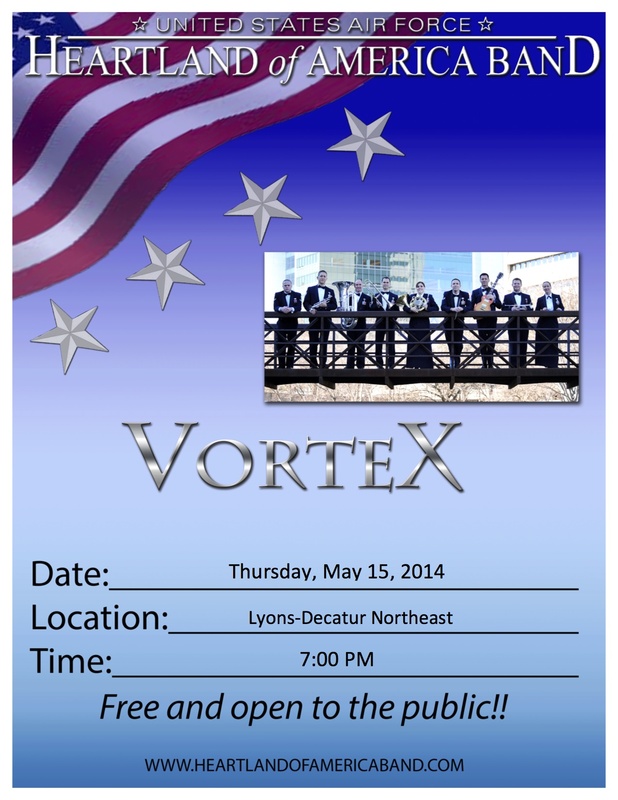 Whether inspiring audiences to greater patriotism or adding prestige to military events, Vortex is sure to impress. 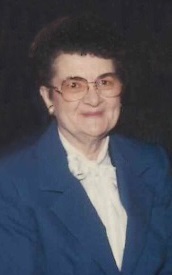 WILLETA O. PETERSON, 91, of Fremont, Nebraska, passed away Sunday, April 27, 2014, in Fremont. Willeta was born July 25, 1922, in West Point, Nebraska, to Wilhelm E. and Olivia (Ludwig) Kuester. She was baptized into the Christian faith on August 27, 1922, at St. John’s Lutheran Church, rural Beemer by Rev. F. W. Daberkow and was confirmed at St. John’s on April 14, 1935, by Rev. E. L. Borgmeyer. Willeta attended school at District No. 48. On February 1, 1942, Willeta and Myron E. Peterson were united in marriage at St. Paul’s Lutheran Church in West Point by Rev. Ared Oelschlaeger. They farmed in the West Point, Beemer and Lyons areas before moving to Fremont in 1971. Myron passed away August 20, 1999. Willeta was a member of First Evangelical Lutheran Church in Oakland. She was preceded in death by her parents, husband, Myron; sister, Leota Mahnke. Survivors include her sons and daughters-in-law, Darwin and Linda Peterson of West Point, Dean and Cathy Peterson of Papillion, NE; daughters and sons-in-law, Parnell and Dr. Michael Thoene of El Cajon, CA, Nerita and Ron Getzschman of Fremont; ten grandchildren, sixteen great grandchildren and very special friend, Colleen Sanny. MEMORIAL SERVICE: Friday, May 2, 2014, 2:00 p.m. at the First Evangelical Lutheran Church in Oakland. The Tiger Invite was held during one of the best weather days of the spring season and the Cougar track teams took advantage of it to post several personal bests. The boys and girls both placed seventh with 26 points by the girls and 30 by the boys. After a disastrous Cougar Invite, Darcey Simonsen threw a career best at Tekamah. At the home meet last week, the junior had no measurable throws in the prelims with a foul and two out of bounds tosses. Darcey was the class of the field last Tuesday with a winning toss of 118 feet 4 inches. The mark is among the top distances in Class D.
Freshman Jon Christiansen was the winner in the boy’s triple jump. He broke through the forty foot barrier at the meet. He got a leap of 40 feet 8 inches in the early jumps. In the finals he followed that with the winning distance of 41 feet even. Taylor Fuston ran his first open 400 meter dash of the year. Fuston picked up a second place with as time of 54.6. The senior also placed fourth in the long jump with a leap of 19 feet 9.25 inches. Chevy Henneman earned two medals in the sprints. He placed fourth in the 100 M in 11.6 and sixth in the 200 M in 24.6. Joey O’Connor had an improvement of over twenty seconds in the 3200 M run. The freshman took fifth in 12:07.5. David Bishop added a sixth in the 800 M with a time of 2:19.4. Libby Henneman followed up her big throw at the Cougar Invite with another solid effort. She heaved the shot put 33feet 11.24 inches. Libby placed third. Kelly Wakeley added a fourth place in the girl’s triple jump. She had a best jump of 31 feet 7 inches. Charlene Dill was a 33 year old mother of three in Orlando, Florida. She worked three jobs to support her family. She had a treatable heart condition. Charlene also fell into the “coverage gap” – she made too much money (a whole $9,000 per year) to qualify for Medicaid in Florida, too little to qualify for a subsidy to purchase insurance on the new health insurance marketplaces, and none of her jobs provided health insurance. She was uninsured. Florida decided not to expand their Medicaid program as allowed under the Affordable Care Act to cover low-income working people like Ms. Dill. On March 21, while working one of her jobs, she collapsed and died on a stranger’s floor from the preventable condition for which she could not get treatment. Let us pray there are no Charlene Dills that suffer the same fate in Nebraska. But there likely are. Research shows that there will be at least 500 preventable deaths in Nebraska due to the Legislature’s failure to expand Medicaid to our low-income working friends and neighbors. State Senators Bloomfield, Brasch, Coash, Garrett, Janssen, Kintner, Larson, McCoy, Murante, Scheer, Schilz, Seiler, Smith and Watermeier opposed attempts in both the 2013 and 2014 Legislature to expand Medicaid to those in the “coverage gap.” They would not even allow a vote to provide health insurance coverage for these working adults. They may all be back serving in the Legislature in 2015. Let’s hope they can figure out this is a life and death issue, not a political game. Has anyone else noticed how buggy it is already? And wasps seem to be in abundance! We usually don’t have a problem with those little gnats until we are bringing in garden veggies, but we have them now! Found a trick to get rid of them I thought I would share. Fill a jar with apple cider vinegar, put the lid on, poke holes in the lid and place the jar, or jars, in the room where they are. I have a jar in the kitchen and bathroom and I have several dead ones already and I just placed the jars late yesterday afternoon. Better than bug spray, and safer! Dorla A. Swanson, 84, of Fremont, NE formerly of Walthill, NE passed away Monday, April 28, 2014 at Arbor Manor in Fremont, NE. Arrangements are pending with Munderloh – Smith Funeral Home in Pender, NE. WILLETA O. PETERSON, 91 years of Fremont, Nebraska, passed away Sunday, April 27, 2014, at Arbor Manor in Fremont. Northwestern Monona County in west central Iowa, north central Burt County in Nebraska and southeastern Thurston county also in Nebraska. Nickel size hail is possible with this storm. Locations impacted include Emerson, Walthill, Winnebago, Decatur, Macy and Lewis and Clark State Park.